Mexico scored twice in the final five minutes to beat Uruguay 3-1 in a pulsating Copa America Group C match in which each side had a man sent off on Sunday. 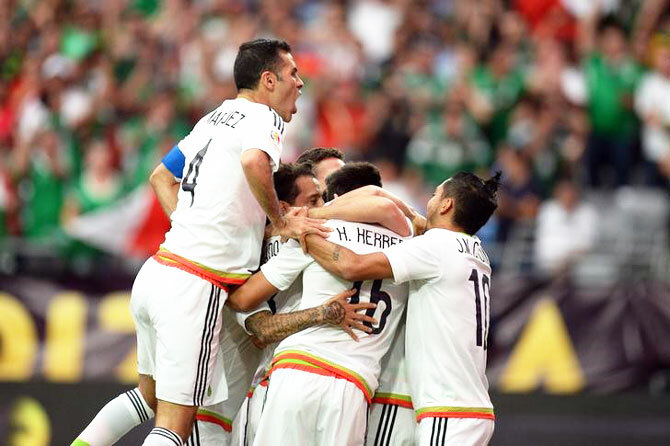 The win in front of a passionate and partisan crowd at Glendale, Arizona left Mexico top of the group on goal difference from Venezuela after they beat 10-man Jamaica 1-0 in Chicago. The early omens were not good for Uruguay who stood stunned before kickoff when the Chilean national anthem was played instead of their own. Mexico then made a lightning start with the fastest goal of the tournament so far in their first incursion into the Uruguay penalty area in the fourth minute. Hector Herrera and Uruguay's Alvaro Pereira both leapt to meet Andres Guardado's curling cross from the left with the defender heading into his own net. Uruguay, who had Matias Vecino dismissed on the stroke of halftime after a second booking for a foul on Jesus Corona, equalised in the 74th minute from the free kick awarded when Guardado was also shown a second yellow card. Carlos Sanchez, the man Guardado brought down, hit the free kick into the box where captain Diego Godin headed past Alfredo Talavera to put the record 15-times champions back on level terms. Mexico, however, had the last word when their captain Rafael Marquez scored a fine goal from a corner, finding the top corner of Fernando Muslera's net with an angled shot from the right. With the Uruguayans pushing forward in numbers in search of another equaliser, Herrera made the result safe in the second minute of added time with a header from Diego Perez’s neat flick across the face of goal. Uruguay, without injured striker Luis Suarez and on the back foot for most of the first half, missed two good chances either side of halftime. Edinson Cavani, put through by Nicolas Lodeiro, was one-on-one with Talavera but the goalkeeper closed him down and blocked his effort after 30 minutes. In the 58th minute, Godin broke into attack from his own half and laid off to his right for Cavani who crossed to fellow striker Diego Rolan on the left but his finish was poor and ended up on the wrong side of the near post. 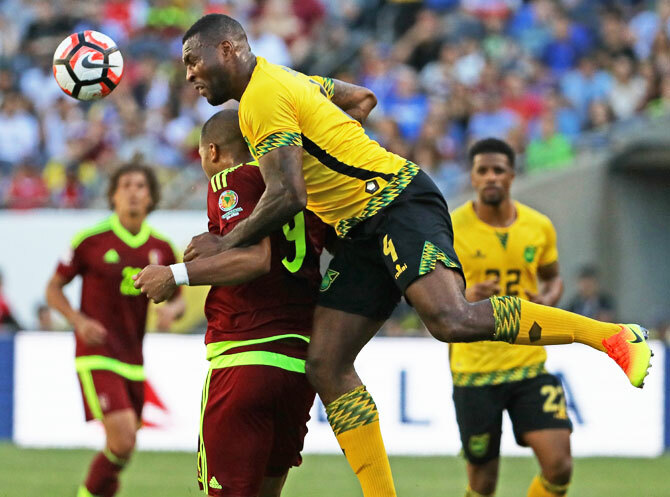 Jamaica, who have now lost all four of their Copa America matches by the same 1-0 score, had the first chance at Soldier Field when a header from Je-Vaughn Watson hit the bar in the 11th minute. Venezuela, whose highest finish at a Copa America was the 2011 semi-finals in Argentina, went ahead after 15 minutes when Alejandro Guerra set up Josef Martinez and the striker shot under goalkeeper Andre Blake. Eight minutes later, Jamaica’s Rodolph Austin was sent off after he caught Tomas Rincon’s ankle with his studs as he followed through after winning the ball in the tackle. Jamaica's coach Winfried Schaefer was sent to the stands for the second half after a heated discussion with referee Victor Carrillo at the break. The Caribbean islanders fought hard in the second half but Michael Hector hit the post with a shot and, at the other end, Blake needed to make a superb save from Wilker Angel's diving header. Mexico play Jamaica next in Pasadena on Thursday when Uruguay meet Venezuela in Philadelphia.